What babies eat during their first 1,000 days of life can have an significant impact on how important structures and connections in the brain develop, according to the nation’s leading group of pediatricians. To avoid “lifelong deficits in brain function,” the American Academy of Pediatrics (AAP) says it’s crucial for parents and caregivers to ensure children get key nutrients during this critical window of development. In a new set of guidelines, the group calls for increased attention to nutrition during the period of time spanning from conception to the child’s second birthday. Certain nutrients -- including protein, zinc, iron, choline, folate, polyunsaturated fatty acids, and vitamins A, D, B6, and B12 -- aid in healthy brain development, says the AAP’s Committee on Nutrition. Children whose diets are lacking these key nutrients may experience lifelong issues in brain function. "The brain's structural foundation, along with billions of brain cells and trillions of connections between them, are built during this sensitive window of time," said Dr. Sarah Jane Schwarzenberg, lead author of the policy statement and an executive committee member of AAP's Committee on Nutrition. "Key nutrients provide the building blocks needed so that a child's brain can grow and develop normally," she said. To set the stage for healthy brain development, experts recommend following a healthy diet before conception and while pregnant. Eating well before a child is born can have an impact on their brain development, experts say. It can also increase the chance that they’ll be open to eating a range of healthy foods later. "The first ways that babies learn about foods is by experiencing the flavors from the mother's diet that get transmitted to amniotic fluid and then breast milk,” Dr. Julie Mennella, an expert on infant sensory development, told ConsumerAffairs. 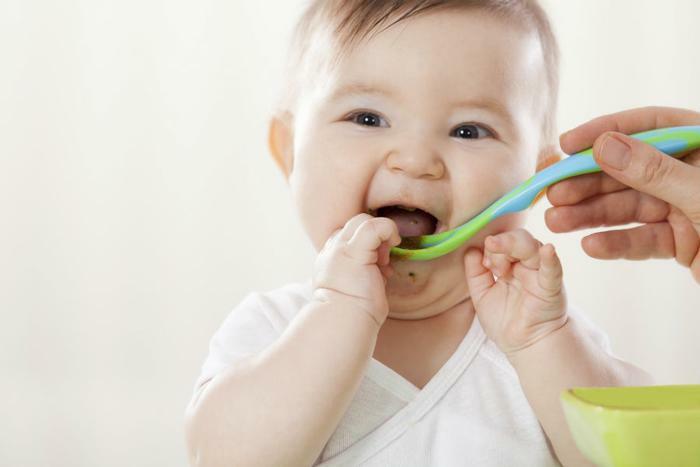 “Babies are more accepting of foods that contain these flavors when they transition to solid foods. So to get your baby off to a healthy start, eat the healthy foods that you enjoy when you are pregnant and lactating, knowing that you are teaching your baby to learn to like these foods as well." Start with breast milk. Breast milk is recommended for newborns until they are about six months old. The AAP recommends exclusive breastfeeding until six months of age if possible and continuing after solids are introduced for at least the first year. Introduce iron-rich foods. After six months, an infant’s diet begins to require more iron and zinc than breast milk can provide. Parents and caregivers should aim to introduce babies to foods rich in iron and zinc, such as infant cereals or pureed meats. Transition to healthy foods. When babies are older, parents should make sure their diet includes a variety of healthy foods, including meats rich in proteins and fruits and vegetables that contain different vitamins and minerals. The AAP suggests asking your child’s pediatrician to recommend foods that supply critical nutrients for brain development during this critical window of development. The AAP’s new guidelines have been published online in the journal Pediatrics.